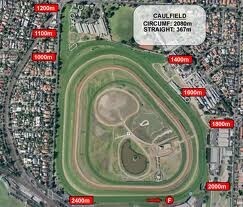 Caulfield Racecourse is one of Melbourne, Australia's best-known horse-racing tracks. Commonly known as "The Heath" by local racegoers, it is located eight kilometres from the Melbourne CBD, on the boundary of Caulfield and Caulfield East in Melbourne's south eastern suburbs. 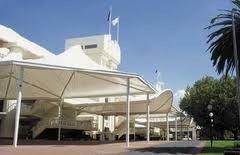 It is home to the Melbourne Racing Club. The track has a triangular shaped layout, comprising three straights, 30 metres wide, with a total circumference of 2080 metres and a finishing straight of 367 metres. All turns have a 4% to 6 % banking. Racing takes place in an anti-clockwise direction. The totally glassed in Rupert Clarke stand provides an uninterrupted view of the racecourse. Caulfield has about 20 racedays each season and hosts some of the Australia's most famous and historic races including the Caulfield Cup, Caulfield Guineas, Blue Diamond Stakes, C F Orr Stakes, Oakleigh Plate, Underwood Stakes and Futurity Stakes.